Its a bit rich for him to complain about £9K - when he threw away £10,000.00 of our money (without asking) to help his rather wealthy friend: Mr Toad face the standards board. So do I have it right that people who point out waste in the Council, ask for explanations for expenditure that looks bloated and blog about 'vindictive w**kers'? Isn't usually on Labour Council Leaders who attack Conservatives as acting with 'malice' for calling for cuts in waste and taxes? Why can't this, so called, Conservative Leader attack waste with such vitriol rather than attack fellow Conservatives? What kind of wreckless political judgement is behind such statements by someone aspires to be an MP one year before major local and national elections? 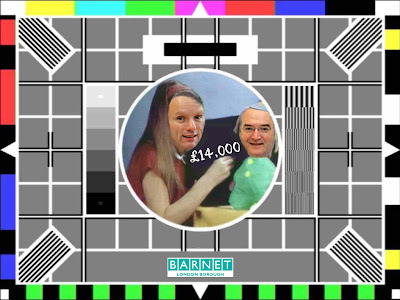 The sad truth is that the barnet tories are useless and combine the worst elements of the Tories, Labour and Lib-Dems. Crass stupidity eventually crosses party lines. I know that Tories wont vote Labour, so it is really up to them to provide a suitable alternative. If they don't, they'll end up sooner or later with someonelike me running the council, purely as a protest vote. In the space of a few days, there have been two reports published dealing with the financial management of the council - Icelandic investments and the purchase of televisions for senior officers. Whilst the amounts of money involved were vastly different in each case, there was one common factor: councillors abdicated control and responsibility to unelected officers. What we are now witnessing is a systemic and wilful failure by the Executive to exert any kind of control or scrutiny over those charged with the day to day running of the council. Freer can call me all the names under the sun if it makes him feel better, but there is simply no escaping the fact that all these management failures happened under his watch. He can blame whoever he likes, but it won’t wash with the public. The buck stops with him.